Let’s face it, weekday mornings can be quite overwhelming amidst back to school chaos. But there are small “tweaks” you can make to ensure a less stressful, more productive AM as the kids run around frantically… cue: your trusted cup o’ joe. And you don't even have to remember a measurement or numbers early in the morning because Folgers now offers Perfect Measures! Perfect Measures® coffee tabs are 100% pure coffee. Coffee beans are roasted and ground, then compressed into tablets without the use of additives or processing aids. The tabs brew the same way as regular roast and ground coffee, minus the measuring. It comes in several flavors: Classic Roast, Classic Decaf, 100% Colombian, Black Silk, Breakfast Blend. 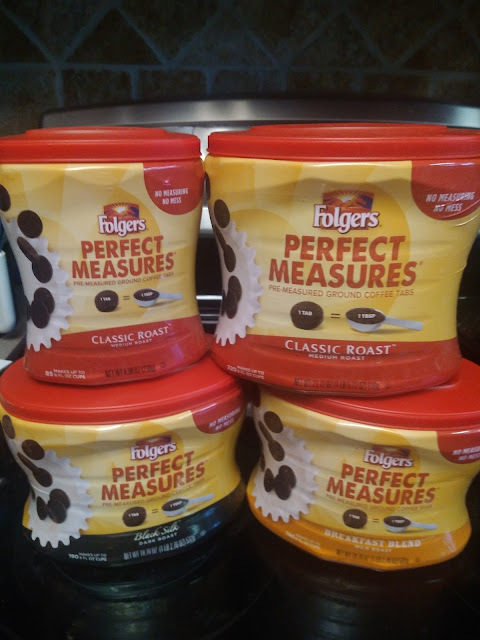 With Folgers Perfect Measures, you get a consistent, great tasting pot of coffee every morning! Most of all, I love that there is no additives and it is designed for use in all Automatic Drip Coffeemakers! You can purchase Folgers Perfect Measures at your local store.